So I didn't get as much reading done this weekend as I had hoped, but I did finish at least one other book, which I'm not sure I'm going to review. 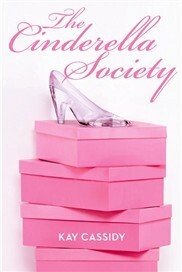 The book I finished was The Cinderella Society by Kay Cassidy and I am totally confused about my reaction to it. On the one hand, my literature teacher-self enjoyed all the symbolism and saw right away that this was an allegory. On the other hand, it was a little too sorority for my liking - but that's my own prejudice entering the reading experience. At times I thought the story was too simplistic, and at others it felt too contrived and complicated. These contradictions, however, keep the story interesting and certainly kept me turning the pages. I'm interested and intrigued enough to read the next installment. During Thanksgiving, most of us stop and give thanks for the blessings in our lives, but I'm someone who likes to do that on a daily basis rather than just once a year. I feel like prayers of petition are not worth God's time if we never stop to give Him thanks and praise for the good in our lives. I'm thankful that I live in a community with an abundant, active library. I'm thankful for my worn out library card from said library. I'm thankful that I work in a school where my principal lets me teach reading and writing the way I want to teach it and not the way some standardized test wants me to teach it. I'm thankful for my zeal for learning and only hope that I'm imparting it on my students. I'm thankful that I was born in a country and into a family that values education - even if we don't always get it right. I'm thankful that I can sit here on my couch with my computer on my lap and write about my opinions without having to worry about anyone beating down my door and throwing me in jail. I'm thankful for books and the authors who write them. We'd be a race of neanderthals without them. So, besides the obvious, (food, shelter, family...) what are you thankful for? Great post... I also wish I had been able to read more, but I am thankful I at least had the time to pick up a book. Lovely post. Yay for libraries and freedom of expression. I was a bit conflicted over The Cinderella Society as well. My review was a bit vague but I did enjoy the book overall. Glad you got a chance to read it.